Veteran winemaker and accomplished Pinotage producer Neil Ellis takes us through his 2009 Vineyard Selection Pinotage, msourced from a single vineyard in the Jonkershoek Valley. Paul Kemp, owner of Loma Prieta Winery in California, joined me for dinner earlier this month as he paused in London on his journey home from South Africa to San Francisco. Paul has become enthused with Pinotage and believes he is now the largest Pinotage producer in the America’s, having bought in all the grapes he could find to add to his own increasing plantings. While he was in the Cape the Pinotage Association had arranged a series of tastings during which he visited winemakers at Simonsig, Beyerskloof and Kanonkop Estate. He told me he was blown away with the breadth and quality of the wines he tasted. He had not been able to find many South African Pinotages back home. He had shipped a case of his own Pinotages to the Cape for tasting and had saved two bottles for me. We started with a sparkler I was certain Paul wouldn’t have previously encountered, the Ridgeview Estate Merret-Cavendish 2006 methode traditionelle, an excellent English estate sparkler. 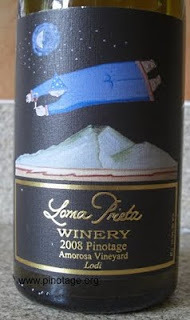 Paul suggested we opened his 2008 Loma Prieta Pinotage and keep the 2009 for later. He wanted the wine decanted, but I poured the wine to see how it developed in the glass. At first it reminded me of an Italian wine because of its acidity which made it ideal for food pairing. After about 15 minutes the wine softened and became more voluptuous with juicy berry flavours and after about 40 minutes it was showing underlying coffee flavours. The evolution was most interesting. I am not sure I would have identified this wine as Pinotage in a blind tasting although the later coffee aromas were a hint. It was an excellent wine rich in berry fruits and rewarding drinking. Paul says that he can sell all he makes of his Pinotage and has customers who pre-book cases. In the USA many wineries operate ‘wine-clubs’ where subscribers receive regular shipments of wine and Paul has started a Pinotage only club which already has a thousand members committed to buying his Pinotage. That’s one of the reasons Paul is fast planting more Pinotage, a variety he thinks has a bright future in California. We also opened Te Awa 2006 Pinotage from Hawkes Bay and L’Avenir Estate 2003, made by Francois Naude whom Paul had met in the Cape. Te Awa was most delightful, lean like a greyhound and L’Avenir was at its peak of elegant maturity.